Hard working Army soldier who drives to work hard and stay motivated. Able to learn new tasks quickly and proficient, I like maintaining professionalism with everything I do, staying on time and being on time everywhere I go and always willing to try something new to better myself and make sure I always give 150% always. performing simple duties like putting up merchandise on the shelves for customer buy, also cleaning my department and helping organize the store for the next morning. detailing vehicles, from washing and drying to vacuuming the interior scrubbing stains getting bad smells out. buffing and washing exterior of the vehicle. 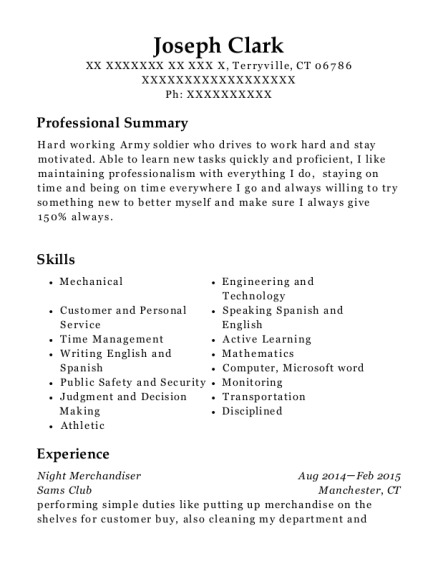 Security Officer Aug 2013－Jan 2014 Securitas security services East Hartford, CT performed interior and exterior patrols making sure the post and workers I were working for were safe also working the cameras watching the perimeter and depending on post assigned to I give customer service to anyone needed to know where to go or who to see. produced customer service making sure the customers were happy and found what they needed. also cleaning my department up keeping it presentable. mainly putting products up and filling in shelf holes that need products for customers. worked outside and inside of store helping customers with their products that they purchase, incase they are heavy such as mulch, stone, bricks, wood etc... also producing customer service inside making sure the customer finds what they need. also put all equipment in the proper areas for customer use and kept parking lot clean. 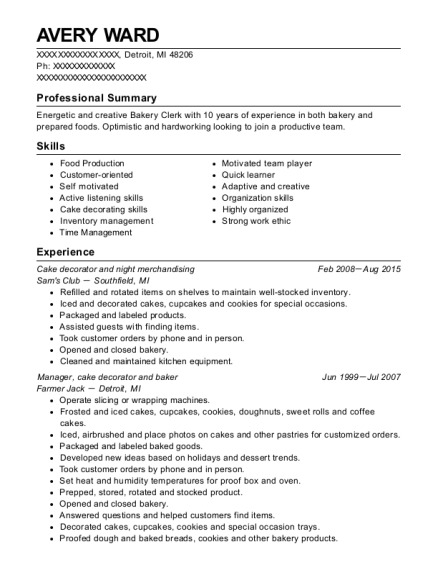 This is a resume for a Night Merchandiser in Terryville, Connecticut with experience working for such companies as Sams Club and Golden nozzle. 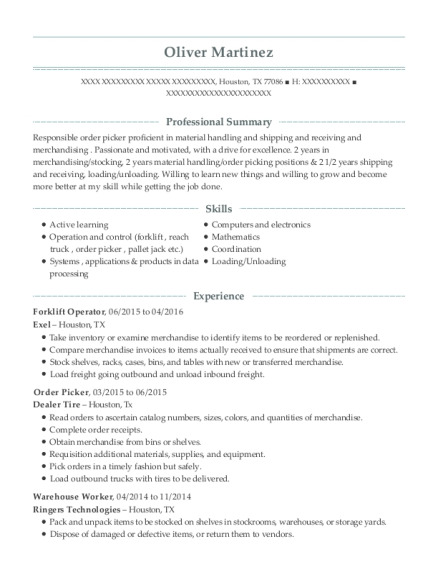 The grade for this resume is 0 and is one of hundreds of Night Merchandiser resumes available on our site for free. 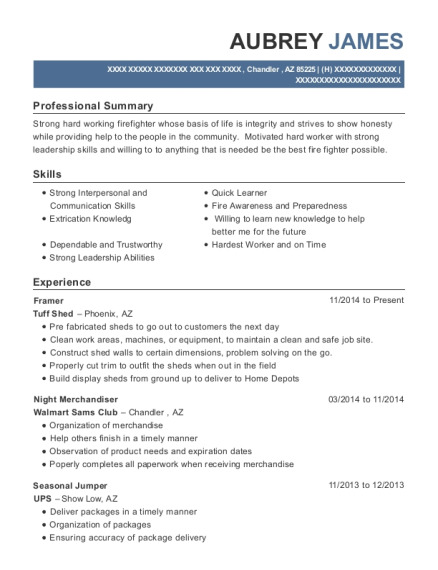 Use these resumes as templates to get help creating the best Night Merchandiser resume.